Judy met me at the entrance of the church, “Ryan will be healed tonight!” she proclaimed. Judy’s beautiful young son had been tragically injured in a pool accident when he was very young. She brought Ryan to Mass every day. Sitting in his wheelchair, Ryan’s six-year-old face had an angelic stare, as though he had been given a glimpse of heaven. Ryan’s mom Judy was a living saint. She worked full-time, taking care of Ryan along with her other boys and her husband while faithfully attending Mass every day. She often could be found praying in the church on her way to work or on her way home. Even so, Judy’s certitude made me nervous; I worried that if Ryan weren’t healed, Judy’s faith might be shaken. I was seated in the church directly opposite Ryan, facing him. When the healing service began, a priest carried a monstrance, blessing those present who were sick; a religious sister with the gift of healing prayed aloud, asking the Lord to heal all of those who were seeking his touch. I became more anxious as the priest got closer to Ryan. Suddenly I found myself wondering: What would I do if Ryan were healed? This young man had been frozen in this position for the three years I had belonged to this parish. If he suddenly arose, I realized, my entire world would be turned upside down. I literally broke into a sweat as the priest approached Ryan. When he finally stood in front of Ryan, the boy moved his head and looked at the monstrance containing the Blessed Sacrament, the Real Presence of Jesus Christ. Then something totally unexpected happened—I heard a voice! It seemed to come from the Eucharist in the monstrance: “It’s okay, I’m trapped too.” I thought I saw a smile form on Ryan’s face. The healing service continued, and Ryan’s peaceful stare returned. Ryan died a few weeks later. I ran into his mom about a month afterward, and she told me that she felt his death was the miracle: He had left this world peacefully and totally unexpectedly. She was thankful for the years God had given her to spend with her son after his accident. I think of Ryan when I read the Gospel account of the man near the pool of Bethesda (see John 5:2–15). While the story may seem like just another healing miracle, it shares a slight difference with several other healing stories—the man is instructed to take up his pallet and to walk away with it. Most commentators make no mention of this, but it strikes me as significant. Surely Our Lord was concerned about something other than littering the pool by the Sheep Gate. The command is reminiscent of the Lord’s command to his disciples to take up their crosses and to follow him. What the cross and the pallet have in common is that they are signs of weakness. Once the man is healed, the Lord tells him to take up the sign of weakness and to carry it with him. Perhaps he intended the pallet to be a physical reminder that his strength came not from himself, but from God. Too often the gospel is preached in a way that makes no allowance for weakness. Much of the scandal in the Church has come not from the weakness of the few clergy who have fallen so much as the inability of their superiors to acknowledge this weakness publicly. In the early church there was a group called “penitents.” These were individuals who had fallen in sin and sought reentry into the Church. Though they were welcomed back, they were made to do penance for the rest of their lives—and often wore distinctive garb that manifested to others their weakness. There is great power in weakness that we all fear. 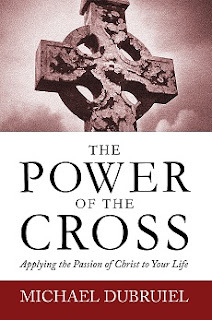 The cross of Christ trapped the Son of God but did not restrain his power. When Our Lord comes to us in the Eucharist, he comes to us in what would appear to be the ultimate sign of weakness, becoming our food, putting himself totally into our hands. There is great power there. In northern Ohio there is a church dedicated to Our Lady of Sorrows; in the basement is a room containing signs of weakness that have been left behind by those who have experienced the power of God at that shrine. Among whiskey bottles, cigarettes, crutches, and leg braces is a mat that once carried a paralyzed man there—who left empowered by God to walk again. I suspect that the most powerful stories of healing, however, come from those who were unable to leave anything behind. Their weakness, whatever it was, remained with them; however, they had been empowered to carry their weakness in the power of God. This type of healing often goes unnoticed. Even so, it is the greater healing, because it enables us to share in the cross of Christ, to embrace our weakness in the power of God. For the follower of Christ, weakness need not mean defeat!